Global demand for cast polymers will rise 6.6 percent yearly to 246 million square meters in 2019, with a value of $23.1 billion. The Asia/Pacific region will remain the largest and fastest-growing market. Solid surface will remain the dominant type while engineered quartz, marble and other stone will grow the fastest. 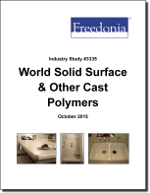 This study analyzes the 179 million square meter world cast polymer industry. It presents historical demand data (2004, 2009 and 2014) and forecasts (2019 and 2024) by type (solid surface, engineered stone, gel-coated composites) and application (e.g., residential countertops, nonresidential countertops, sinks) for six world regions and 18 major countries. The study also considers market environment factors, details industry structure, evaluates company market share, and profiles 41 industry players, including DuPont, Caesarstone, and Cosentino.